Why not make your next company event a memorable experience by holding it in the spectacular setting of a marquee? With aesthetics such as solid walls, glass windows, lockable doors and innovative flooring systems, our marquees can be used for one-off corporate events or even as a replacement for a showroom undergoing refurbishment. Here are five reasons why one of our marquees might be the perfect solution for your corporate gathering. The nature of corporate events varies hugely from seminars, conferences, award ceremonies and business dinners through to Christmas and summer parties and ever-popular team-building sessions. Why not add a touch of style to your corporate gathering and opt for this to take place in a new and inspiring setting? Attendees can often be a little jaded by the typically sterile surroundings offered by many conference venues. So why not use a marquee to inject some creativity into proceedings? Choosing a venue that can comfortably accommodate all of your guests can often prove to be tricky. For example, you may have a particular easily accessible area in mind, but this might be off limits due to a lack of suitable venues in the vicinity. However, by opting for a marquee you will be able to entertain your desired number of guests with ease. Pardon the pun, but marquees provide a blank canvas from which your perfect company event can be planned. Whether you are seeking a high-end look and feel or a more low-key approach, perhaps with touches of rustic charm, our marquees will enable your company gathering to be tailored to your exact requirements. Also, all of our marquees can be customised to your particular corporate colour scheme. Marquees allow for complete flexibility in terms of bespoke event management. You will have complete freedom to tailor the event to your every need. Many hospitality venues impose restrictions on bookings, such as using specific caterers or menus, rigid or set operational hours and even limits on venue dressing or lighting. 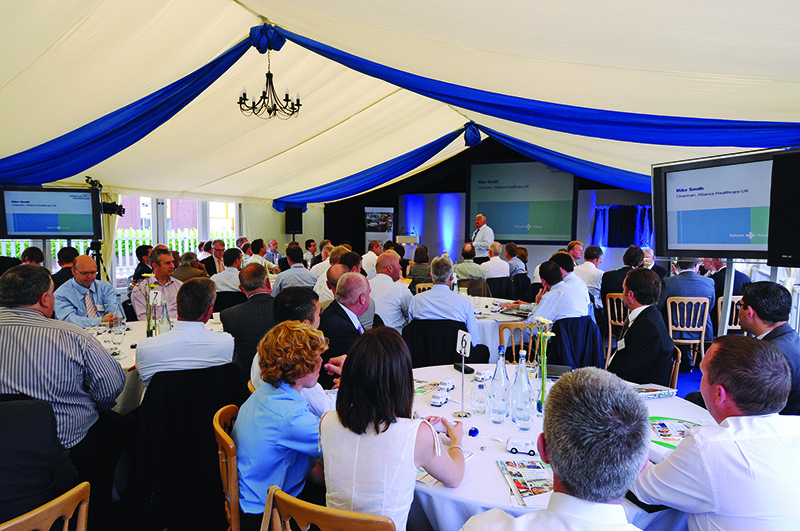 A marquee allows you to choose whichever suppliers you wish and to ensure your corporate event is free of limitations. Last, but by no means least, marquees are a very cost effective option with the added bonus of no hidden costs. Event organisers are frequently left disgruntled after finding their original quote omitted to mention the ‘added extras’. Now you know the fantastic benefits that marquees can offer, why not add character to your next corporate event by using one of our marquees? We have worked with many established brands including the BBC, Babcock International, and MTV right through to independent family run companies. Please contact us if you would like any further information or to learn more about our experience of ‘under canvas’ corporate events.